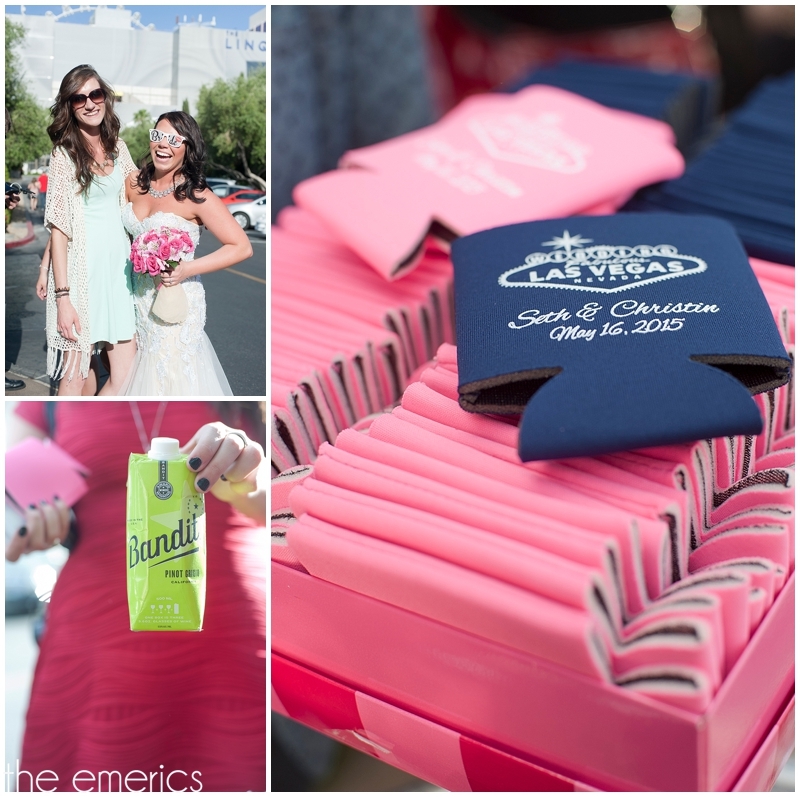 Christin and Seth came from Ohio to tie the knot in fabulous Las Vegas! Christin knew she wanted to embrace the fun party atmosphere Vegas had to offer, but she didn't want to overdo it! I think her vibrant color scheme and fun tributes to old Las Vegas throughout her reception decor turned out perfect and really created that look she was going for! I mean, the groom & groomsmen fedora hats were spot on and the feather centerpieces were too cute! She also had adorable Hangover Kits to welcome her guests and a wedding weekend timeline to keep everyone on schedule. Being a huge itinerary planner myself, I just loved that little detail :) Before we headed into the reception, we met up with Christin and Seth in their rooms at the iconic Flamingo Resort and Casino where they were getting ready. They chose not to do a first look, but Christin and her dad had a first look right before heading down to the ceremony. It was such a sweet moment. After their ceremony, we took a walking tour of the strip as we headed to Joe's Seafood Steak & Stone Crab Restaurant at the Forum Shops at Caesars. We had a blast walking down the strip, taking photos along the way, and enjoying the perfect spring weather! After their fabulous luncheon reception, we went on double decker tour with them and their guests! It was such a fun idea to get them all together to continue the Vegas fun and we were able to get some more shots in front of the iconic Welcome to Las Vegas sign and other casinos on the strip. With so many small details and things to coordinate, Christin chose to have Jessica from Team Harman Events help with the day-of coordination. It was such a good idea to have Jessica there to make sure everything went smoothly and efficiently from event to event. I seriously don't think the day could have gone any better! I know Christin & Seth were able to have the Vegas wedding they wanted and planned so hard for and their friends and family had an absolute blast! So many beautiful memories were made that day and we couldn't be happier to have shared and document their first day day together as Mr. and Mrs.
Christin + Seth: We wish you many more fun-filled days of laughter and love! Hair & Makeup Artist: Amelia C & Co.